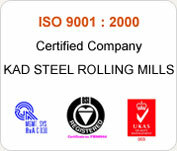 We serve the nation of quality stainless steel products but also contribute towards Eco-Friendly environment. Stainless Steel (S.S) Sheet, Stainless Steel (S.S) Circle, Stainless Steel (S.S) Pipe, Stainless Steel (S.S) kitchenware, Stainless Steel (S.S) Kitchenware Machinery, Moulds for Kitchenware. Copyright (c) 2006. www.kadindia.com All rights reserved Designed & Developed By: Krish inc.